Eneco Luchterduinen has officially marked the start of construction of the 129MW Dutch offshore wind farm by commencing tunneling for the onshore section of an electricity cable at the junction of the Teylingerlaan with the Torenlaan in Voorhout in the municipality of Teylingen. Located 23km off the coast between Zandvoort and Noordwijk, the project will transport electricity to the shore via a 23km long 150kV underground cable, onshore section of which (8km-long) will connect the beach of Noordwijk to TenneT’s transformer substation at Sassenheim, ultimately connecting to the national grid. 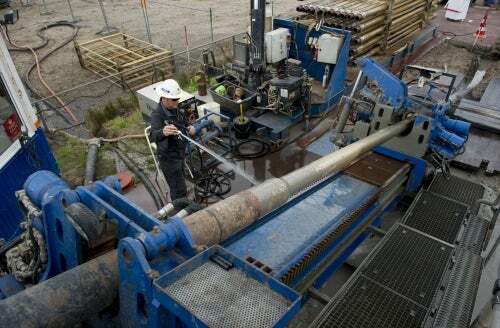 Contractor Joulz is responsible for installing the underground electricity cable, while Visser & Smit Hanab will cater drilling-related needs of the cable deployment at the project, jointly owned by Eneco and Mitsubishi. "The offshore wind project, which is estimated to cost around $45bn, is expected to be operational by 2015." Of the total length of the cable, 80% is being installed at a depth of 20m – 25m using a process of directional drilling, while the remaining 20% is being built at a depth of around 1.2m – 1.8m using open excavation in trenches. As part of the onshore cable construction, Joulz and Visser & Smit will initially carry out directional drilling, install flexible pipelines and subsequently begin laying cables in early 2014, while offshore construction is likely to begin in summer 2014. Early this month, Vestas bagged a contract to provide the V112-3.0MW model turbines and a 15-year full-scope AOM 5000 service and maintenance agreement. Early this year, Mitsubishi had acquired a 50% stake in the project as part of an agreement with Eneco.